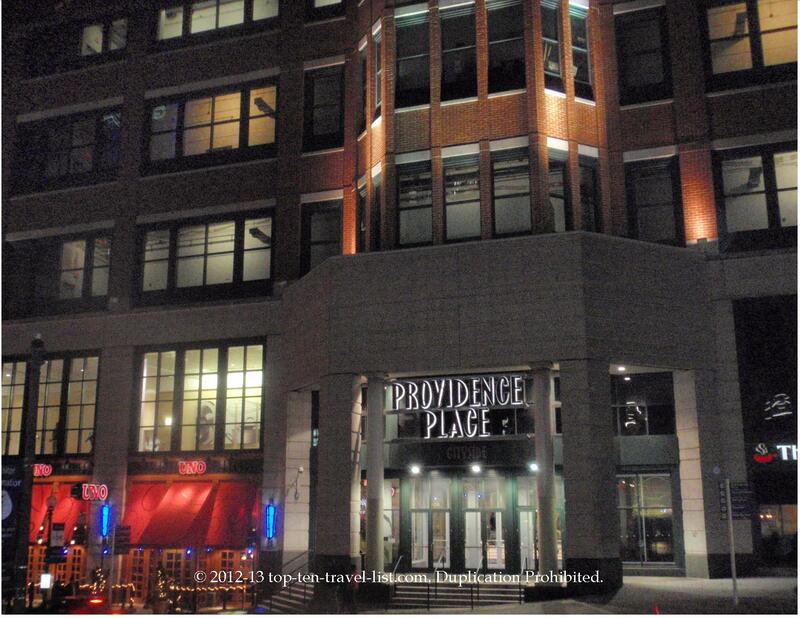 Providence Place Mall: Rhode Island's Largest Mall - Top Ten Travel Blog | Our experiences traveling throughout the US. Providence Place Mall is a large shopping center located in the downtown area of Providence Rhode Island. This mall is the largest in Rhode Island and one of the largest in Southern New England. Regular hours are Monday-Saturday from 10:00am – 9:00 pm and Sunday from 12:00 noon – 6:00pm. Providence Place Mall is probably the best choice in the area. There are plenty of great stores, entertainment options, and restaurants. The Dave and Busters arcade is a fun time especially since it is located inside the mall so you have other options for food and entertainment as well. My favorite restaurant in the mall is probably The Cheesecake Factory or The Melting Pot. It is not the best mall in the world and there are a lot of drawbacks, but all in all it is a great way to spend a rainy or snowy afternoon. *There is no Brookstone! One of my favorite novelty stores – I have seen smaller malls in the area with a Brookstone, so this is strange to me. *Rude employees – I was shocked at how snooty some of the employees were, especially those working in JC Penney’s and Macy’s. *Plenty of entertainment options like Dave and Busters and an IMAX and a nice assortment of restaurants – Cheesecake Factory, P.F. Changs, Uno’s Pizzeria, The Melting Pot. *Clean and well organized (the entertainment is located in the same area). *There is a Restoration Hardware store – I love this store! The have the nicest faux fur blankets and accessories!